Since Frank and I shared our home this year; we had little time alone - just the two of us - something we've taken for granted in past years. It made our lazy days in Nicaragua, unexpected time in San Diego and gallivanting all over San Francisco more special. We were free to be us. No distractions. 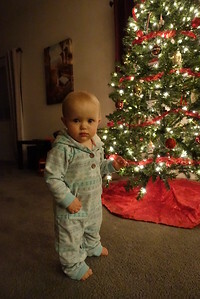 Baby giggles, seeing the world through a toddler's eyes and witnessing the curiosity of a pre-teen was simply the best! That joy, wonder and interest is the magic that makes one's heart full. Appreciating the gift of everyday, getting another chance to try again, to do better, or maybe, even, fall apart. Often, it is as simple as watching Carpool Karaoke with James Corden. Now that Christmas is over, can we move along to summer? Please! How's that for a bah humbug? The warmth might not return quite as fast as I'd like, but at least the days are getting longer. I might see the sun again soon. I can't be the only one that misses daylight, can I? I'm lacking vitamin D in a bad way. 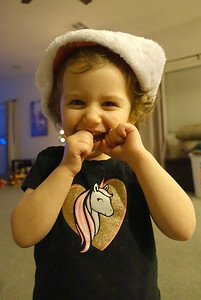 That said, I hope you all found the magic of Christmas this holiday. I had these cute santa babies to help keep me in the holiday spirit. 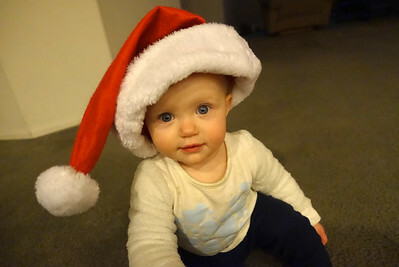 Addy is beginning to have an understanding of the holiday happenings, and Lex was pretty oblivious, but she did seem to enjoy the ornaments best for her first Christmas. 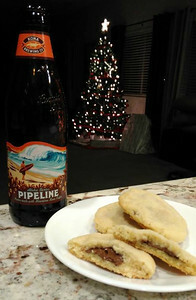 Santa didn't pay Frank & I visit this year since there were no kiddos in the house, but I think he would've enjoyed Pipeline Porter & nutella stuffed sugar cookies as much as I did. 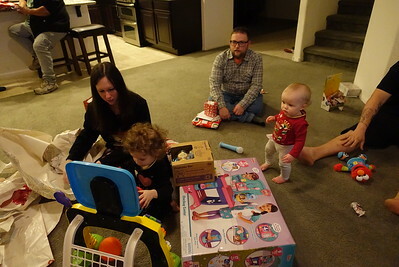 He did bring the kiddos all sorts of goodies - Nick must have been especially good this year, he was thrilled to find a PS4 under the tree. On christmas day Mike, Tuco and Blaine came out from Pahrump. My dad, Amy, Jeff and the kids came over, along with Frank's uncle, and later, his cousin and her boyfriend too. I cooked a ham and the fixings. Parmesan salad and Snow tunnel cake too to keep up mom's tradition. I thought this Christmas might have been a little easier since it was the second without her, but the sting of sadness didn't fade a bit. 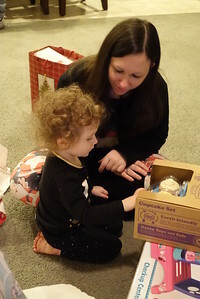 Even so it was nice to enjoy the best gift of the season, gathering together. 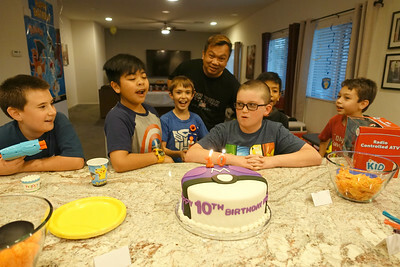 Last month, we celebrated Nick's 10th birthday. 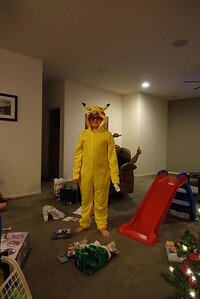 Like most kid's his age he's been obsessed with Pokemon. 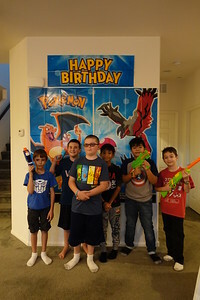 He told us months before his birthday that he wanted a Pokemon themed party. I looked into various options and narrowed down party ideas to two and I let Nick have the final say. 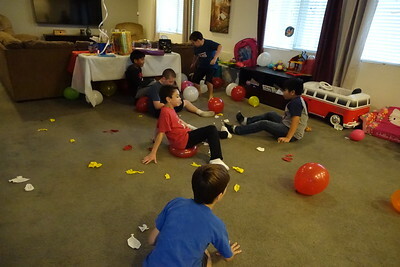 Instead of a painting party (Pikachu) he chose a party at home with a bounce house. I wasn't sure a bounce house would fit in the backyard, but I measured twice and it'd be tight, but it would indeed fit. 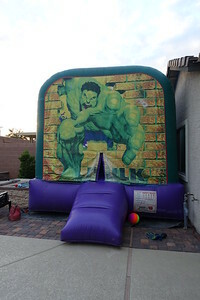 I didn't account for the bounce house to move with all the kids jumping inside of it so one of our bushes took a beating, but otherwise the bounce house was a great success. The Incredible Hulk didn't quite fit the theme, but no one seemed to mind. 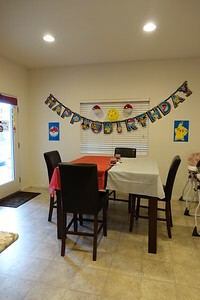 A couple months prior to the party, I bought the Pokemon decorations from a Facebook garage sale group, $7 well spent! Invites and Thank you cards I downloaded from Etsy. 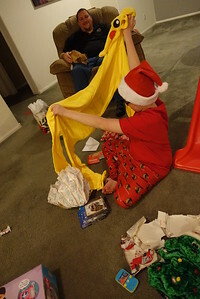 I taped dollar store table clothes together to create pokeballs and I made a Pikachu balloon that was a crowd favorite. I found free printables online to dress up odds and ends that tied everything together. I also created a game called, Pikachu Pop. 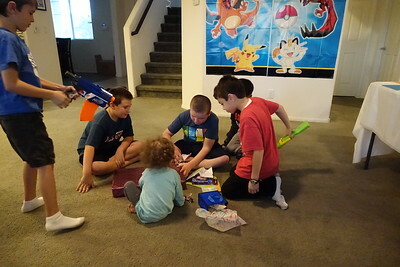 I stuffed small Pokemon toys (Amazon) into balloons and had the kids catch them all by popping the balloons on their butts. 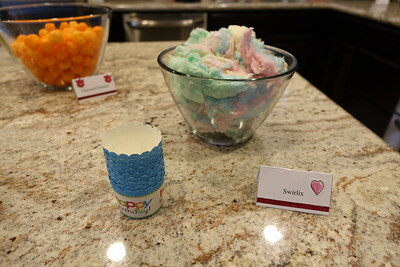 It was a frenzy of screams and giggles - a real hit! 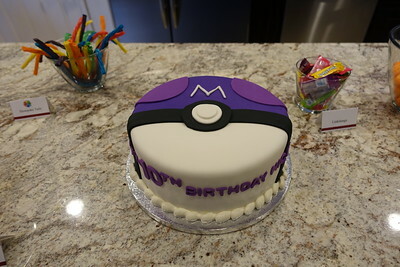 Amy had a friend make the Master Pokeball Cake. 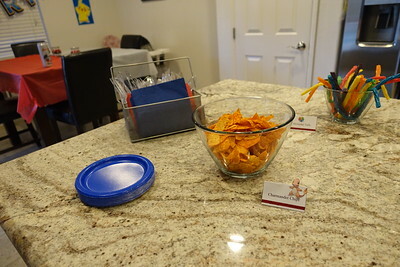 It was the perfect center piece for all of our snacks. 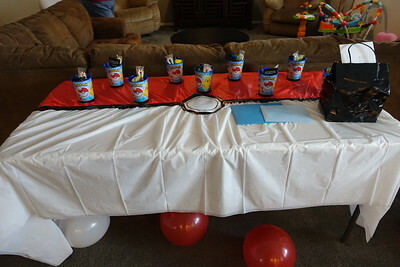 Treat bags were Pokemon cups (party city) filled with treats and Pokemon wristbands (Amazon). Said and done, a fun time was had by all. BRRR! It's cold. I don't expect any pity, it's likely far colder wherever you are than here in Sin City, but still my hands and feet are icy. I'm bundled in two coats as I sit here in front of the PC. This winter stuff is for the birds. Wait! Even they don't do winter. I should make like a bird and migrate south because the desert isn't cutting it. Anyhow, can you believe this time next week Christmas will be over? And we'll be waiting to welcome 2017. Pure craziness. I thought I'd keep a more regular schedule after my last update, but it wasn't in the cards. The past month has been a complete whirlwind. It began with a team meeting called at work. 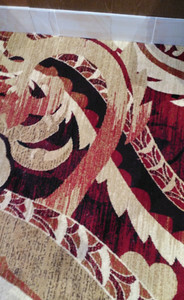 The owners gathered us around and shared that they had been in negotiations to sell the business. It wasn't a huge surprise, but I didn't know how close we came to laying off 95% of the office staff, myself included. They couldn't seem to agree on a number so they've decided to go the distance, not sell and instead invest in us and the company's future. Changes are underway, but it appears we won't be losing our jobs. As a result, I find myself with little down time. At home, our pc is toast - Frank started shopping for the pieces to build a new one, but his time has been monopolized by other things so that's the cause for the crickets around here. I hope everyone had a lovely thanksgiving. My dad and aunt arrived Nov 15, it was nice to catch up a bit before the holiday and the rest of the visitors arrived. My mother in law arrived next, and then Bob & Hugh flew in just in time for the gluttony to begin. Sixteen of us gathered around the table noshing on a spread that consisted of mixed greens & apple salad, yeast rolls, cranberries, sausage stuffing, corn casserole, green bean casserole, mashed potatoes and very moist turkey. And later, apple and pumpkin pies. Let's not forget the several bottles of wine that kept things merry. With full bellies, we battled each other with hilarious rounds of Fibbage, Cards Against Humanity and other games. You simply cannot beat a house that's full of loved ones and laughter. There was no Black Friday shopping for me. 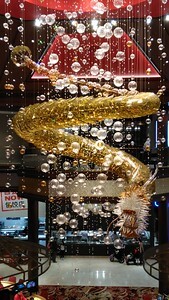 Instead, Frank and I took Bob & Hugh to see Lucky Dragon and we also checked out Desert Wind Coffee Roasters beforehand. What a great coffee shop, and they share my love of Breaking Bad. Very cool. Then, on their last night, we all had dinner at Joe's. It never disappoints! The stone crab and steaks are always stellar. Afterwards, the six of us went over the Rio for a tour and tasting at the Wine Cellar. It's such a gem, if you've never been, it's definitely worth a visit. Next, we saw Rock of Ages. Too bad the show ends it's run in January. It was a hoot. December 1st we celebrated Frank's birthday. His gift was rather bittersweet for me - Amy, Jeff and the kids moved out. I'm thrilled they found a townhouse to rent. It's in a great area, it's very nice and it provides them with some much needed space, three bedrooms and a two car garage. It's only a few minutes from us so Nick is able to stay in the same school and we'll be nearby so I won't have to miss them too much. 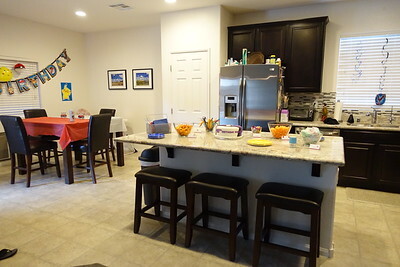 Sharing a home for almost a 1.5 years has its challenges, but also its rewards. Watching the kids learn and grow day to day was something I'll always cherish - even if it meant I was sick - A LOT. 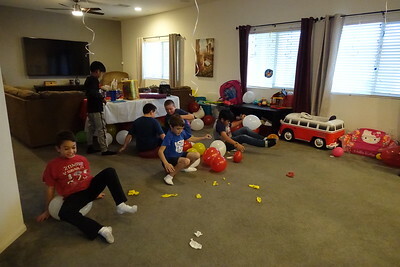 Our house was busting at the seams with the seven of us, eight if you count my dad or nine when Mike would stay (Pahrump is far, after all) and now it's rather bare. We have big plans for some home improvements, but first we must narrow down some options. We also took advantage of low interest rates by refinancing the house - so long PMI and we're reducing our loan to 15 years - If all goes well, we'll be debt free by 51! 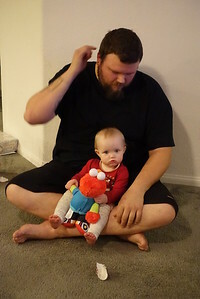 Even with the kids out of the house, we still managed to have one last bug make the rounds. I think Nick picked up this one from school. It ran through everyone. Frank and I weren't even safe - babysitting for a few hours was all it took to become infected. The downtime gave us an opportunity to binge watch some Netflix shows. Goliath and The Crown were both very good. It had been far too long since I was excited about a show. Well, besides my guilty pleasure This is Us. And now, we're just days from Christmas. My shopping was pretty quick and painless - Thank you, Amazon Prime and Etsy. I'll be hosting Christmas day. This year will be a little different than last year, since we all won't be under one roof. We'll lose the magic of Santa paying us a visit, but Addison is filled with wonder and it should make for a pretty special holiday. Lex will likely enjoy the wrapping paper more than the gifts themselves, and Nick will tear through them in record time I'm sure - but that's all part of the fun. Wherever you are, wherever you go I hope your Christmas is merry and bright. 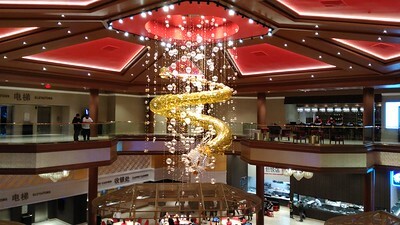 Last week, rather than Black Friday shopping, we went down to Lucky Dragon to see the first newly built casino since Cosmopolitan opened five years ago. 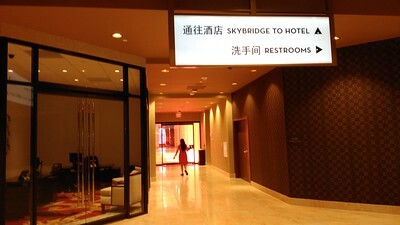 Access was easy from Sahara Ave and the garage was a piece of cake to navigate, the parking garage elevators lead you directly into the casino. The casino itself is smaller than I expected, but well laid out. It doesn't feel the least bit cramped. It's incredibly clean, stylish and rather comfortable. 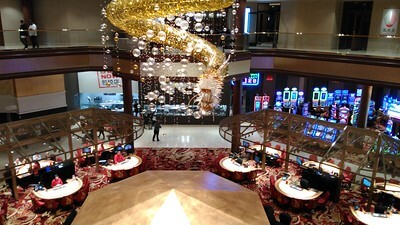 The slot club is offering free play $8-$888 for new sign ups. It's worth a visit. I brought my camera to snap photos, but I foolishly forgot to add the memory card. So, cellphone photos it is.